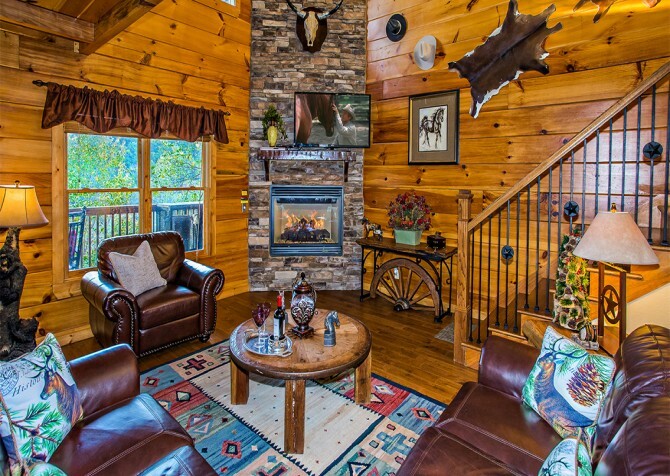 Spend quality time with family and friends at Majestic Forest, a 3-bedroom, 5-bathroom (3 full and 2 half) cabin in Pigeon Forge. Watch the big game on one of 6 HDTVs, enjoy an evening soak in the outdoor hot tub, hunt bucks on the arcade unit, rest in the porch swing with lush wooded views, and splash around at the community pool! From cuddles by the gas fireplace in the living room to homemade meals in the fully equipped kitchen, precious memories are easily made at this lovely abode. Leave your bags in the car and head straight for the living room — you deserve a rest! Cozy up with your spouse on the corner seat of the sectional, keep an eye on the little ones while they play on the area rug, and let grandpa take a snooze in the arm chair. When evening comes, light a fire in the gas fireplace to set the mountain mood for a friendly chat with your buds. Better yet, flip on the big screen TV to catch up on all your favorite shows or tackle a movie marathon with the satellite TV! Featuring stainless-steel appliances and granite countertops, the fully equipped kitchen in this home will make every meal a breeze. Store soda pop in the refrigerator, pop popcorn in the microwave for movie night, bake fudgy brownies in the oven for a sweet treat, brew a Starbucks blend in the coffeemaker whenever you wish, blend a healthy smoothie for breakfast, and let the dishwasher clean up the mess while you’re hiking on a Smoky Mountain trail. No matter the time of day, a bite to eat is only a few steps away! A spacious dining area awaits bountiful breakfasts, fresh lunches, homemade dinners, and sinful midnight snacks — yum! With a wooden dining table for 8, enjoy lush wooded views from the large windows all around. Plus, the natural light makes the space perfect for after-lunch arts and crafts and coloring time with the kids. Raise your vacation entertainment up a notch by hosting a game tournament in the rec room. Complete with a pool table, deer hunting arcade unit, game table for 4, an HDTV, and a wet bar with a mini fridge, your friends and family will be smiling for days! There’s even a queen sleeper sofa for when you just can’t get them to leave. Challenge your bestie to a rousing round of pool, knock out the high score on the arcade unit, play a classic card game on the game table (bring your lucky deck! ), watch a superhero show on the flatscreen TV, and enjoy a cold one at the end of the day. Why limit yourself to only one master suite when you can have 3? That’s right! This Smoky Mountain cabin features 3 master suites — each complete with a king-size bed, jetted tub, gas fireplace, and flatscreen TV! Cuddle up with the one you love, bathe in a sea of bubbles, read a romance novel by the fire, and watch a film classic in bed. There’s also a spacious loft with a twin over full bunk bed, a queen sleeper sofa, and direct access to one of the decks, making it easy to take in the sweet serenade of Mother Nature from the moment morning breaks. Indeed, the great outdoors is where memories are made in the Smoky Mountains, and Majestic Forest is no exception — featuring 3 covered decks and outdoor amenities a plenty. Enjoy morning coffee at the breakfast table for 4, cook a delicious lunch on the gas grill, and dine with family and friends on the outdoor dining table for 6. At the end of the day, enjoy a soothing soak in the outdoor hot tub with a comedy show on the mounted flatscreen TV or simply chill on the bench, close your eyes, and breathe in the fresh mountain air — the rocking chairs and porch swing are also good candidates for a relaxing time. Don’t forget to head into town every once in a while for outdoor activities, such as ziplining, trekking, white-water rafting, helicopter tours, and more! With a flat, paved driveway and only 3 steps into the cabin, funneling everyone in and out of the cars won’t be a hassle. After a day spent in nature, you may want to give your clothes a good clean, and the provided washer and dryer will certainly be a big help. While the laundry takes care of itself, mosey over to the community pool within Brookstone Village, the featured resort of this home, for a splash and a swim in the sun. When you return to the cabin, catch up on a few Hulu Originals or send a few emails with the complimentary high-speed internet or pop in an animated classic in the DVD player for the kids — and the kids at heart! Pigeon Forge doesn’t disappoint with its endless attraction options, from paddling along the river and savoring a gourmet meal to taking selfies with the Smokies and riding epic rollercoasters! Take on all the thrilling rides, quaint eateries, entertaining shows, and seasonal events at Dollywood, an exciting amusement park perfect for the whole family. Put your 5 senses to the test at Magic Beyond Belief, a multi-million-dollar show filled with magical illusions by the incredible Darren Romeo — trained by masters Siegfried and Roy. Fly down and around a forested mountain on the Smoky Mountain Alpine Coaster, where you control the speed and soar at your own pace!